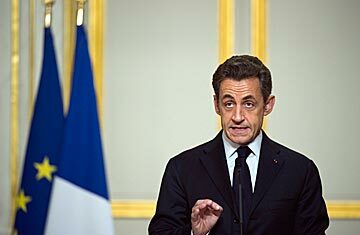 France's President Nicolas Sarkozy delivers a speech in Paris after international talks on Libya. How might the Libya mission go badly? Every country involved in the coalition has its own military and domestic political calculations. But a general sense of what factors are in play can be gleaned from the predicament of French President Nicolas Sarkozy, the Western leader who first came out hard for the intervention against Muammar Gaddafi. In the eyes of the French public, Sarkozy is looking fairly good at the moment. The deeply unpopular President has experienced a small boost of approval at home and abroad because of his role in rallying risk-averse allies into staging air intervention to prevent what could have been a massacre of opponents and civilians at the hands of advancing Gaddafi troops. Sarkozy's hawkishness on Libya "is winning him applause in France today due to the universal hostility toward Gaddafi," says Karim Emile Bitar, a Middle East specialist for the Institution of International and Strategic Relations in Paris, "but that could prove short-lived for several reasons and come back to haunt him." That's because the French public could quickly develop mission fatigue, especially with Paris already imposing an array of austerities to reduce the domestic budget deficit. The moral imperative to help the Libyan rebels may bog down if the French people figure the money involved is better spent at home. The nature of the conflict is more than likely to prolong the intervention or make its open-endedness frustratingly clear. Says Bitar: "Gaddafi has managed to group a large number of his forces within big cities, meaning air strikes to eliminate them aren't going to work unless you're willing to kill far greater numbers of the surrounding civilian population. This is why the air strategy was risky from the start ... By consequence, fears are high that after a certain point, this could go on and on and wear Western opinion down." Then there is the potential quagmire in the tangle of countries associated with the alliance against Gaddafi. Already, in Europe, there is disagreement between prointervention countries and nations like Germany and Italy on both the military operation and how to deal with Gaddafi. The French and British issued contradictory statements on the ultimate overseer of the operation. Paris indicated that a contact group of nations would essentially run the Libya mission; London stressed that the NATO command structure would ultimately make the strategic and military decisions. There is not just French and Western public opinion to worry about. "If the military operation goes on for very long," says Bitar, "Arab public opinion will begin rapidly [to compare] it to Iraq and start viewing it as another kind of invasion of an Arab country, rather than an attempt to let Libyans determine their fate in a fair fight. And that's not even considering the possibility of large numbers of Libyan civilians' being killed as collateral damage in strikes, or if they get caught between opposing forces in what becomes an open-ended civil war. There, too, Arab public opinion will turn hostile to the intervention and blame it for the unending violence and death." Bitar warns of unintended consequences. "Up till now, uprisings in Arab countries have largely been spontaneous, national affairs that have ebbed and flowed, succeeded or failed without outside intervention, and as struggles between popular desire and resistance from regimes." However, he says, "should Libya become primarily associated with outside intervention and the death and destruction that produces, it could have a real quashing effect on the aspirations and ambitions that have been driving the Arab Spring up till now. And that  combined with continued unrest and chaos in Libya  could also have a very real impact on the search for new systems of government in Tunisia and Egypt. We could very well see some of the old-guard elements in those countries looking over at Libya and deciding, 'O.K., let's stop playing around and impose our will here. Look what the will of the people gets you.'" And things could still go wrong even if the rebels prevail. "Who are the figures leading the opposition?" Bitar asks. "They're almost all veterans of the Gaddafi regime who defected once the wind had turned and are now trying urgently to make sure they didn't back the wrong horse. They may all turn out to be valuable partners and committed democrats who want to bring prosperity and human rights to Libya once Gaddafi is gone. Or they may turn out to be other kinds of people  we won't know for a while. But there's a risk there too, and one Sarkozy will have to live with." Sarkozy won a fair measure of praise for being the first leader to recognize the Libyan opposition as the legitimate leadership of the country  but even that may come back to haunt him if things go wrong. Sarkozy's decision was taken almost on the spur of the moment, and under the spectacular browbeating of mediagenic philosopher Bernard-Henri Lévy, who decided to make a crusade to protect the Libyan opposition a reprise of his 1990s campaign as the savior of the Bosnians during the Balkan war. Sarkozy reportedly did so without even consulting newly named Foreign Affairs Minister Alain Juppé (who was said to have been both hostile to the move and aghast that a media star had taken his role as France's top diplomat). "There may be heavy consequences," says Bitar, "when a President makes decisions based on input by celebrities." Read "In Defense of Inconsistency." See photos from inside the tents of Muammar Gaddafi.